Vasilyeva LN, 2001. Mikologiya i Fitopatologiya 35: 15-18. 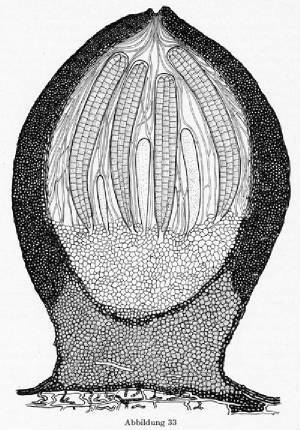 Zogg described L. mayorii Zogg on Pinus and Larix from the Swiss and French Alps, but noted that L. mayorii differed from other species of Lophium in having rigid, band-forming ascomata, thus with less fragile peridia as compared to typical species of Lophium and Mytilinidion. 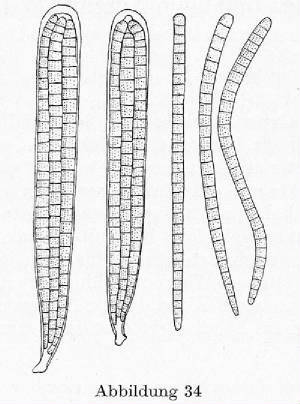 Vasilyeva (2001) found the same fungus in the Russian Far East and stated that it differed sufficiently from other species of Lophium in having gross, erumpent crowded ascomata, band- or ridge-like in appearance, as compared to the smaller, fragile, and entirely superficial fruitbodies typical of species of Lophium and made the transfer to Zoggium mayorii (Zogg) Vasilyeva (Vasilyeva 2001). Vasilyeva (2001): “Hysterothecia erumpent from wood tissue, scattered or in small groups, elongated, band- or ridge-like, black, 1.5 – 2.5 mm long, 1 – 1.5 mm high. Asci clavate or cylindric, 100 – 120 x 12 – 14 μm, numberous. Ascospores widely filiform or vermicular straight or curved, 7- transversely septate, slightly coloured (hyaline when immature), 80 – 90 x 3.5 – 4 μm. Type: Zoggium mayori (Zogg) L. Vasilyeva. The gross and erumpent hysterothecia of Zoggium mayori differ considerably from the small, fragile and superficial fgruitbodies of Lophium and Mytilindion“. Zoggium mayori (Zogg) L. Vasilyeva. Illustration from Zogg (1962).